Sorry about the brief hiatus in my posting -- I've actually been out of town for the last few days to attend some dear friends' wedding down in Santa Fe, New Mexico. Isn't it lovely and adorable? If only my decorating skills were of that caliber! The orange tiers were a chai cake with some sort of butternut cream layer underneath the fondant, while the blue tier was a chocolate-orange cake with a meringue layer. Yum. Also note that Santa Fe is another high-altitude city, approximately 7,000 ft above sea-level -- so props to the cake makers for a beautiful high-altitude cake. So again, congratulations to Sophie and Tim! Since this is the first wedding I've been to in a while, I'm not too sure about what the appropriate words are -- may your marriage be long and blessed, wonderful and happy. Is that too cheesy? Sorry. 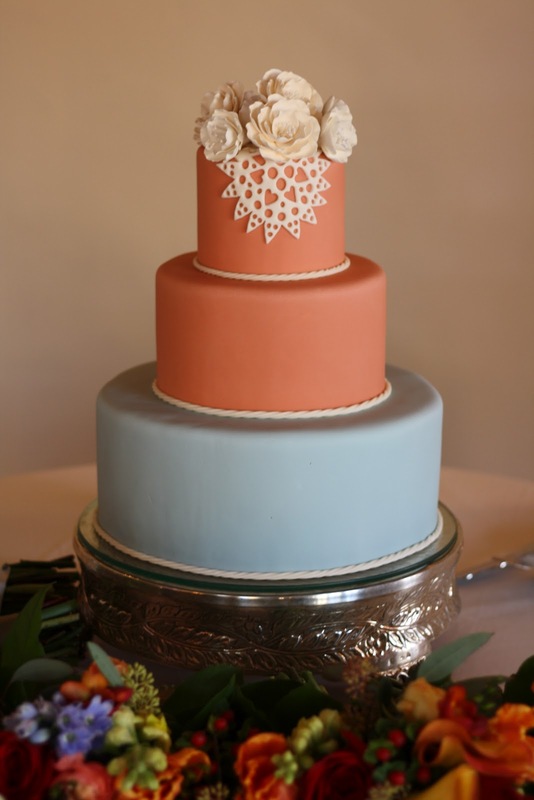 Note that I used a picture from the Hummingbird Bakery's website. Because here's a confession: I've never made this recipe at sea-level before. I was going in blind. Put the flour, sugar, cocoa, and baking soda in a large bowl and mix with a handheld electruc whisk on slow speed until all the dry ingredients are well incorporated. Put the oil, vinegar, vanilla, and 1/2 cup water in a glass and whisk to combine. Spoon the batter into a cupcake pan lined with paper cases and set aside. Beat together the cream cheese, sugar, egg, vanilla, and salt in a freestanding electric mixer with a paddle attachment (or use a handheld electric whisk) on medium-slow speed until smooth and fluffy. Stir in the chocolate chips by hand until evenly dispersed. Don't overmix, otherwise the cream cheese will start to split. 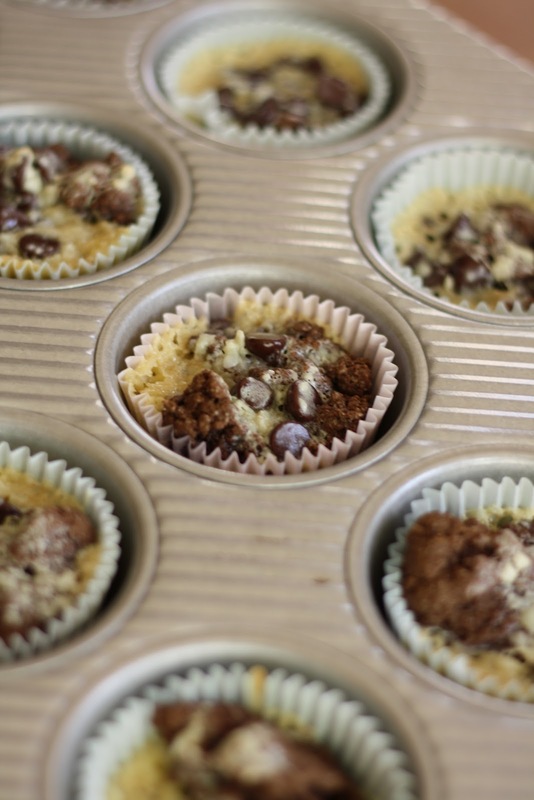 Scoop about 1 tablespoon of the cheesecake filling on top of the cupcake batter in the cases and bake in the preheated oven for about 20 minutes, or until the cupcakes are firm to the touch and they have an even golden color on the cheesecake filling. Don't overbake as the cheesecake will become very dry and crumbly. 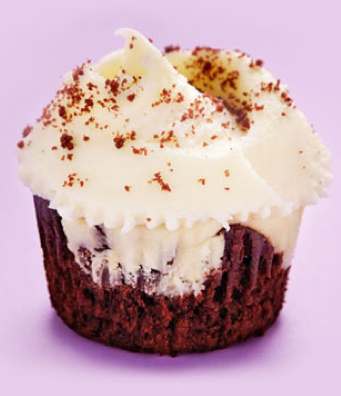 When the cupcakes are cold, spoon the Cream Cheese Frosting on top and decorate with a light sprinkling of cocoa. There were several parts to the recipe -- that is, separate steps for the chocolate cake base and the cheesecake filling. Not a problem, I could deal with that. But the use of sunflower oil in the chocolate cake base as opposed to butter and eggs? All the Hummingbird Bakery cupcakes I'd made previously used butter and eggs in their recipes. I hadn't ever adapted a recipe that used oil. But how hard could it be? The picture above shows what the original, unaltered recipe produces at high-altitude. Dry, chunky clumps of chocolate cake covered in some sticky, liquid "cheesecake". There were so many things that went wrong that I don't even know where to begin. But I think I'll save that for a later post and spend the rest of the night nursing off my wedding hangover. But stay tuned folks -- I have a feeling that adapting this recipe for high-altitude is going to be as long and arduous as the process was for Hummingbird vanilla cupcakes.